UNITED NATIONS, August 10 -- With Rwanda's Paul Kagame declaring victory in an election with 30 media shut down and few opponents who have not been beheaded or chased into exile, Inner City Press has three times asked for UN Secretary General Ban Ki-moon's views and comment. The first time, Ban's spokesman Martin Nesirky said Ban was calling for credible investigation of the death of opponents, like the beheaded Green Party leader. But after Ban's call, Kagame's government issued what many call of a whitewash of the murder. The second time, just before the August 9 election, Nesirky said he didn't have any statement , but would have one soon. On August 10, Inner City Press asked again, including for Ban's response to the whitewash investigation after his last call. “I just said” he asked for an investigation, Nesirky answered. “Next question.” Video here, from Minute 30:56. As UN's Ban's Choice of Kagame Triggers Spanish Boycott, Role of UNDP's Clark; Rwandan to Get UN Women Post? UNITED NATIONS, July 16 -- Naming Rwanda's Paul Kagame to co-chair a UN group of “super heros” for the Millennium Development Goals seemed like a good idea to UN Secretary General Ban Ki-moon. But now the other co-chair, Spanish Prime Minister Zapatero, has boycotted the meeting with Kagame on human rights grounds. Meanwhile, Ban is considering a Rwandan government minister to head the new UN Women agency. Sources in the UN's North Lawn building say Ban got some advice that Kagame, given recent developments in Rwanda, might not be the right choice; the sources infer UNDP and Helen Clark weighing in for Kagame, which has now "blown up in Ban's face," they say. Inner City Press: about this MDG Advocacy Group. 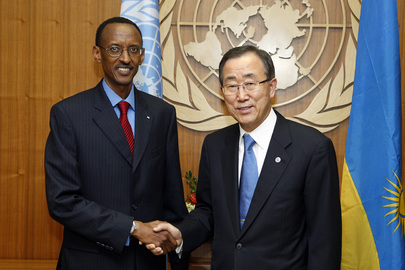 There is a story in El Mundo today in Madrid saying that Ban Ki-moon initially asked Prime Minister [José Luis] Zapatero of Spain to be a co-chair and then later decided that Paul Kagame of Rwanda would be. And it says that Spain was uncomfortable with that on human rights grounds and urged Ban Ki-moon not to appoint Mr. Kagame. I wonder if, one, if you can comment on that and, two, whether, with the recent beheading of the vice-president of an opposition party in Rwanda, what the UN’s thoughts are of the developments in Rwanda and if a Rwandan Minister is being considered to head UN Women? Associate Spokesperson Haq: First of all, the nominations for UN Women are continuing to come in, so I wouldn’t have any comment on any particular names on that. Regarding the El Mundo article, yes, we are aware of that information. We did keep the various parties, including the Government of Spain, informed of the Secretary-General’s choice of President Kagame. Regarding the selection of President Kagame of Rwanda, one of the points on this is that we believe that committed political leadership from both the North and the South is essential to build support for the global partnership embodied in the Millennium Development Goals. Rwanda has displayed extraordinary commitment to the MDGs and is among the few countries in Africa that have made the most progress towards the Goals. There have been commendable declines in both child and maternal mortality there. The country has also made remarkable progress in reducing the number of reported malaria cases and deaths and has the highest proportion of women parliamentarians in the world. So Rwanda’s commitment to the Millennium Development Goals has been outstanding. Regarding the allegations against President Kagame, it’s clear that the Secretary-General is against all violations of human rights and he strongly condemns any such violations of human rights. At this point, however, President Kagame is the Head of State of Rwanda, and it is not for the Secretary-General to prejudge the outcome of any proceedings or accusations that have been initiated against him. So we would need to see what the results of those are. Inner City Press: Does the UN believe, for example, this most recent killing of an opposition leader should be investigated, and by whom? Associate Spokesperson Haq: At this stage, I believe the matter is with the local law enforcement. We’ll see where it goes from there and whether anything else needs to be done. That was before Zapatero boycotted the UN meeting with Kagame. After that, on July 16, Inner City Press and EFE asked Haq why Ban had paired Kagame and Zapatero of Spain, where Kagame is defending human rights charges. Video here. Among the answers not given by Haq: Helen Clark of UNDP. Watch this site. UNITED NATIONS, June 5 -- When Peter Erlinder, a defense lawyer before the UN affiliated International Criminal Tribunal for Rwanda, was arrested in Kigali for things he's said that are related to the defense he is currently putting up for opposition presidential candidate Victoire Ingabire, one expected the UN to protest the arrest. Inner City Press asked, at the UN's June 3 noon briefing in New York, if there was any response by the Secretary General, the High Commissioner for Human Rights, or at least the ICTR. UN Deputy Spokesperson Marie Okabe said "I have no information on that, but I’ll take your question." "We are not yet certain that the arrest has anything to do with Professor Peter Erlinder's work in ICTR as his travel to Kigali was not connected to his mandate with ICTR. When we learnt about the arrest we have immediately sent a correspondence in the form of an Official Note Verbale to the Rwandan authorities to get clarification as to whether the arrest may have had any relationship with the stance Professor Erlinder has taken in the context of the Defence of his client. We have yet to receive a formal reply. Normally, lawyers do enjoy immunity for the stance they take in legal proceedings." Erlinger has been charged for genocide denial, which is what his client is charged with. 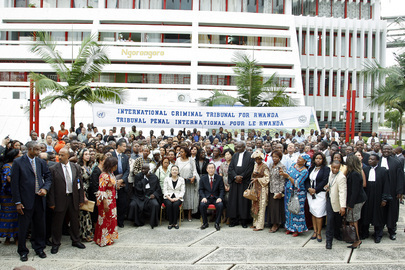 The role of Kagame's RPF is central to the defenses defendants must put up in the ICTR. But if one can be arrested for this, no defense or due process is possible. Erlinder's family thinks the Rwandan government is seeking to physically harm or even kill Erlinder. And the UN affiliated ICTR says, "We are not yet certain that the arrest has anything to do with Professor Peter Erlinder's work in ICTR." Watch this site.